For their Force CX1 group SRAM was able to simplify their shifter/brake levers thanks its 1x setup. The right unit of the Force CX1 Mechanical Shift/Brake Levers is borrowed from their standard Force22 group and brings with it all the associated technology and performance. As with all SRAM shifters, the rear unit features DoubleTap® for up and down shifts with one lever. ZeroLoss™ technology also makes for instant and precise shifts. With no front derailleur in the CX1 group, the left unit loses the shift paddle, shedding unnecessary weight. 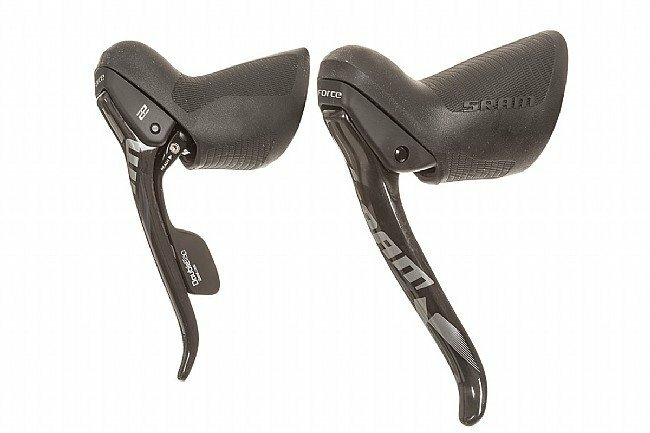 Both right and left feature incredibly comfortable ergonomics inspired by SRAM's Red shifters, ErgoFit textured bodies for better grip and control, and Reach Adjust™ so you can really dial in the fit. The Force CX1 Mechanical Shift/Brake Levers weigh a claimed 273 grams. 11 speed compatible.